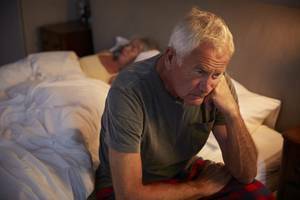 Poor sleep quality and fatigue were significantly associated with increased risk for hip pain exacerbations in patients with osteoarthritis (OA), according to a study published in The Journal of Rheumatology. The investigators of this internet-based case-crossover study sought to assess the role of sleep quality and fatigue in pain exacerbations experienced by individuals with symptomatic hip OA. The study included 130 patients with hip OA who reported experiencing pain 5 to 7 days a week. The participants completed online questionnaires at baseline and every 10 days during a 90-day study period. The primary study endpoint was hip pain exacerbation defined as a 2-point increase in pain intensity compared with baseline. Pain level was described using a numeric rating scale from 0 (no pain) to 10 (worst pain possible). Additional outcome measures were subjective sleep quality and sleep duration, assessed using the Pittsburgh Sleep Quality Index, and fatigue, using the Multi-Dimensional Assessment of Fatigue. The investigators performed univariable and multivariable conditional logistic regression analyses to understand the role of sleep quality, sleep duration, and fatigue in hip OA. In univariable analysis, poor sleep quality was significantly associated with increased risk for hip pain exacerbations (odds ratio [OR], 1.72; 95% CI, 1.04-2.86). Similarly, greater fatigue was associated with risk for hip pain exacerbations (OR, 1.92; 95% CI, 1.21-3.05). After adjusting for physical activity and night pain levels, these associations remained significant. The investigators found no association between short sleep duration and pain exacerbations (OR, 1.40; 95% CI, 0.78-2.51). Additionally, no significant interaction was observed between sleep quality and fatigue (P =.21). Limitations to the study included potential confounding factors, such as medication use, injury, and psychological factors, which were not accounted for, and whereas most data were collected from retrospective self-report, there is potential for recall bias. Finally, the generalizability of the findings may be limited as all participants were required to have internet access and a good understanding of the English language. The findings indicate that poor sleep quality and fatigue are independently associated with increased odds of pain exacerbations in patients with symptomatic hip OA. Clinicians should monitor sleep quality and fatigue levels in patients experiencing hip pain exacerbations.